A DIFFERENZA DELL'SC 5000, QUESTO NUOVO MODELLO E` DOTATO DI UN VERO DISCO IN VINILE DA 7'' AL CENTRO DEL JOGWHEEL, HA LA COPPIA REGOLABILE E IL PIATTO MOTORIZZATO. IL PIATTO E` IN ALLUMINIO PRESSOFUSO ED E` CARATTERIZZATO DALL'ALTA RISOLUZIONE DELLE PRESTAZIONI MIDI (3600 TICK PER ROTAZIONE) CHE ABBINATA ALLA TENSIONE REGOLABILE DEL VINILE PER IL CONTROLLO SLIP/SCRATCH, GARANTISCE AI DJ UNA VERA ROTAZIONE MECCANICA, RENDENDO IL FEELING CON LA MACCHINA UNICO NEL SUO GENERE E IDENTICO A QUELLO CHE SI HA LAVORANDO CON IL GIRADISCHI ANALOGICO. 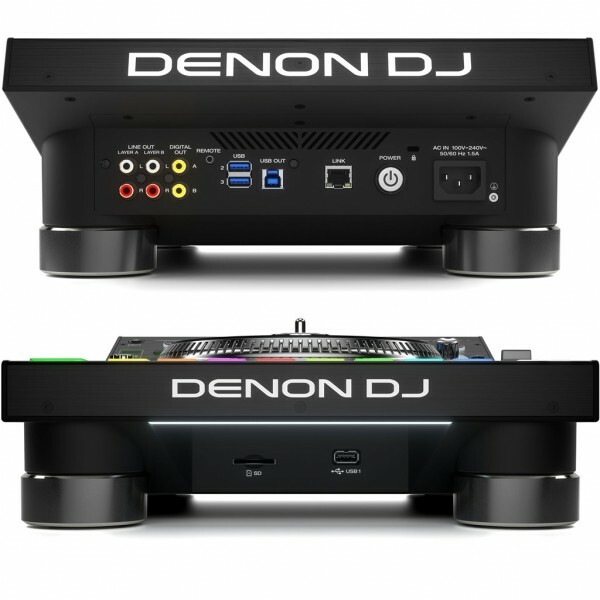 DENON DJ HA PRODOTTO UN MOTORE PIU` POTENTE E CAPACE DI QUALUNQUE ALTRO MOTORE PRECEDENTEMENTE MONTATO SU UN LETTORE MULTIMEDIALE PER DJ E L'HA ABBINATO ALL'ELEGANZA DELL'INTERFACCIA DELL'SC 5000. RUOTANDO IL PIATTO TATTILE E PROGETTATO ERGONOMICAMENTE, QUESTO MOTORE CON TECNOLOGIA BRUSHLESS DC ELECTRIC, HA LA FORZA DI TRAZIONE REGOLABILE. I MOTORI BRUSHLESS SONO DI GRAN LUNGA SUPERIORI RISPETTO AI LORO OMOLOGHI DI TIPO BRUSHED, CON UN ELEVATO RAPPORTO COPPIA/PESO, MAGGIORE EFFICIENZA/AFFIDABILITA`, RIDUZIONE DEL RUMORE E DELLE INTERFERENZE ELETTROMAGNETICHE, OLTRE A UNA MAGGIORE ASPETTATIVA DI VITA. IL MOTORE BRUSHLESS DELL'SC 5000 M NON E` INFLUENZATO DALLA FORZA CENTRIFUGA, MANTIENE UN RAFFREDDAMENTO EFFICIENTE DEI CONDUTTORI ED E` PROTETTO DALLA POLVERE E DALLO SPORCO. 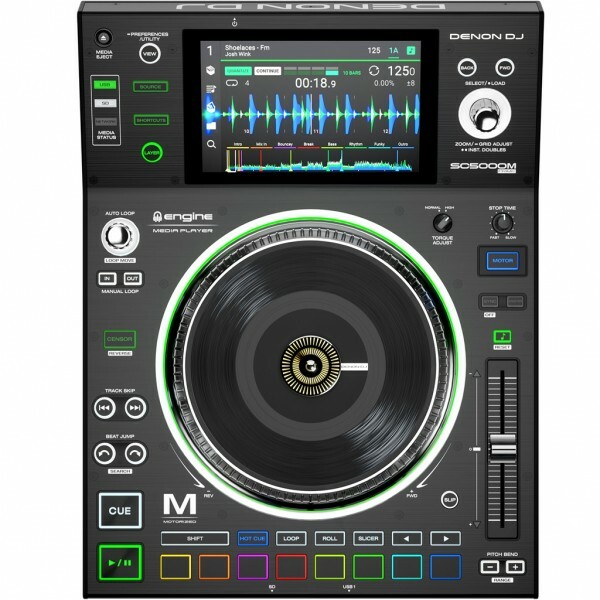 USANDO IL SOFTWARE DI ANALISI E GESTIONE MUSICALE GRATUITO PRIME ENGINE DI DENON DJ I DJ POSSONO IMPORTARE NELL'SC 5000 M TUTTE LE PROPRIE LIBRARY MUSICALI DA ITUNES, SERATO DJ PRO, REKORDBOX®, COMPRESE PLAYLIST, CARTELLE, HOT CUE E LOOP. IN QUESTA NUOVA VERSIONE E` STATO INOLTRE AGGIUNTO IL SUPPORTO INTEGRATO PER CONSENTIRE AGLI UTENTI NATIVE INSTRUMENTS DI IMPORTARE LE PROPRIE RACCOLTE MUSICALI COMPLETE O PARZIALI E DI GODERE DI UN'ESPERIENZA TRAKTOR GRATUITA PER LAPTOP. L'SC 5000 M CONDIVIDE LA STESSA TECNOLOGIA PLURIPREMIATA DEL PROCESSORE MULTICORE DELL'SC 5000 CHE IN OCCASIONE DEL TECH AWARD 2017 HA VINTO I DUE RICONOSCIMENTI PIU` AMBITI COME ''ULTIMATE CLUB DECK'' E ''INNOVATIVE NEW PRODUCT''. LA CONQUISTA DEL PRIMO POSTO IN UN TESTA A TESTA CON IL DIRETTO CONCORRENTE, STA A SIGNIFICARE CHE DENON DJ HA DAVVERO SCONVOLTO IL MERCATO CON UNA SOLUZIONE TECNOLOGICA VALIDA E AVANZATA PER IL FUTURO DEI DJ. 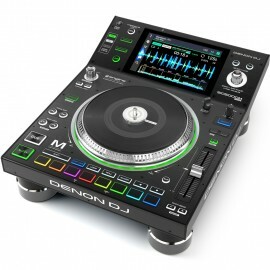 LO SCHERMO MULTI-TOUCH HD DA 7" OFFRE AL DJ LA FAMILIARITA` D'USO DEI MODERNI DISPOSITIVI TOUCH SCREEN. QUESTO SCHERMO AD ALTO CONTRASTO, E` PRIVO DI LATENZA E L'INTERFACCIA DI INTERAZIONE CONSENTE AI DJ DI SFOGLIARE LE LIBRERIE MUSICALI, CERCARE E SCORRERE/CARICARE TRACCE CON FILTRI COMPLETI, TUTTI I PRESET COMPRESI QUELLI TATTILI DI INERZIA, ACCEDENDO ISTANTANEAMENTE A TUTTE LE FUNZIONALITA` CON SEMPLICITA`. TUTTE LE OPZIONI DI VISUALIZZAZIONE ESSENZIALI COME LE FORME D'ONDA GLORIOSAMENTE COLORATE E DETTAGLIATE, IL BPM, LA TRACCIA E LE IMPOSTAZIONI DEL LOOP SONO CHIARE, BEN LEGGIBILI E DEFINITE. LA GESTUALITA` E` LA STESSA CHE UTILIZZIAMO SUI NOSTRI SMARTPHONE. GRAZIE ALLA FUNZIONE DUAL LAYER, COME GIA` AVVIENE PER L'SC 5000, L'SC 5000 M INTEGRA DUE LETTORI COMPLETAMENTE INDIPENDENTI IN UN UNICO CHASSIS CONSENTENDO DI LAVORARE SU UN'UNA MACCHINA (A/B) COME SE AVESSIMO A DISPOSIZIONE DUE LETTORI DISTINTI. CIO` SIGNIFICA CHE IN CASO DI EMERGENZE, I DJ POSSONO SUONARE UN INTERO SET CON UN SOLO LETTORE GRAZIE ALLE DOPPIE USCITE ANALOGICHE E DIGITALI INDIPENDENTI. GRAZIE ALLA FUNZIONE INSTANT DOUBLE DUE DJ POTRANNO INVECE DUPLICARE E CONDIVIDERE FEDELMENTE LA STESSA TRACCIA, TIMELINE INCLUSA. CON L'INSTANT DOUBLE, UN DJ PUO` INVIARE UNA TRACCIA AL SECONDO DJ ATTRAVERSO LA RETE. L'SC 5000 M E` L'UNICO MEDIA PLAYER CHE ANALIZZA LE LIBRARY INTERNAMENTE COMPLETE DI BPM, CHIAVI MUSICALI, BEATGRIDS E FORME D'ONDA, SENZA L'AUSILIO DI UN COMPUTER ESTERNO. UN DJ PUO` SEMPLICEMENTE INSERIRE UNA MEMORIA USB O UNA SCHEDA SD NON ANALIZZATA E L'SC 5000 M ANALIZZERA` INTERNAMENTE TUTTI I METADATI CARICATI IN BACKGROUND, CON LA CANZONE DISPONIBILE PER LA RIPRODUZIONE ISTANTANEA, INCLUSO IL CUEING IMMEDIATO. L'SC 5000 M HA LA QUALITA` DI UNA DAW E UN ALGORITMO DI TIME STRETCHING INTEGRATO CHE CAMBIERANNO PER SEMPRE LE ASPETTATIVE DEI DJ. LA CHIAVE MUSICALE PUO` ESSERE BLOCCATA COSI` COM'E` POSSIBILE EFFETTUARE DEI CAMBI DI TEMPO SUPER-ESTREMI; IN ENTRAMBI I CASI IL RISULTATO SARA` L'INTEGRITA` DI TUTTE LE FREQUENZE AUDIO. GRAZIE AL RIVOLUZIONARIO ALGORITMO DI TIME STRETCH SARA` POSSIBILE MIXARE UNA TRACCIA HIP-HOP A 95 BPM CON UNA TRACCIA HOUSE DA 125 BPM O UNA TRACCIA TRANCE DA 138 BPM CON UNA DRUM 'N BASS A 170 BPM IN UN MIX DI CREATIVITA` E PERFEZIONE. GRAZIE ALL'SC 5000 M POTRETE CONTROLLARE HOT CUE, LOOP, ROLLS E SLICER SENZA L'AUSILIO DI LAPTOP O SOFTWARE ESTERNI. GLI OTTO TRIGGER PAD IN STILE MPC PERMETTONO INOLTRE DI SUONARE I FILE AUDIO DURANTE LE PERFORMANCE DAL VIVO CREANDO DEI REMIX LIVE, BEAT-JUGGLE E DROP DRITTI O A TEMPI TRIPLICATI, CON LA POSSIBILITA` DI BLOCCARE I SETTING DEL QUANTIZE. LA POTENZA DEL PROCESSORE MULTICORE CONSENTE INOLTRE DI SUONARE BEAT E HOT-CUE SEPARATI SU OGNI LAYER MENTRE UNA SECONDA TRACCIA DI SOTTOFONDO SUONA SULL'ALTRO.